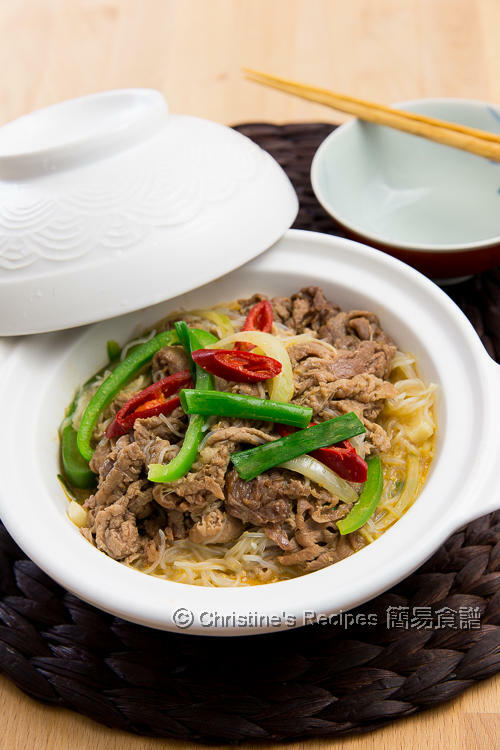 Satay beef with vermicelli noodles are traditionally cooked in an earthen pot (clay pot), a very popular dish on many Chinese restaurants' menu. This dish can be made in an earthen pot (clay pot), or any kind of deep pots, very simple and easy to make. The vermicelli noodles took up and absorbed all the flavours of the delicious satay sauce, beef and vegetables. I’m particularly fond of consuming the noodles and don’t need any rice at all, yet it’s a dish perfectly going with a bowl of steamed rice. Making this dish is very flexible. You can add as many vegetables as you like. Wipe dry the beef with kitchen paper. Cut the beef into two halves if they are too long. Mix with marinade. Set aside for 10 minutes. Heat oil in a wok over medium-high heat. 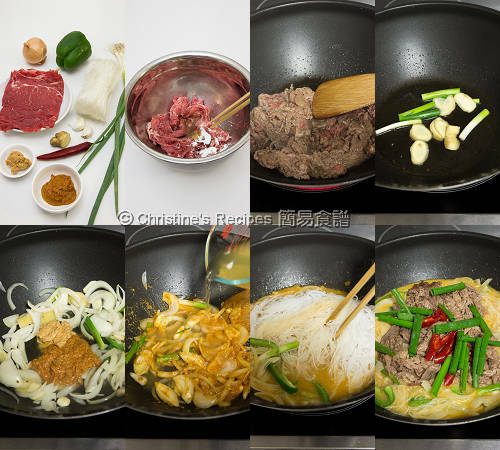 Place the beef in one single layer in the wok. Cook both sides until 70% done. Set aside. In the same wok, add oil to sauté garlic, ginger and white part of spring onion. Add onion and stir fry until aromatic. Push the vegetables to the sides of wok. In the middle, add satay sauce and peanut butter. Saute until fragrant. Stir to combine. Pour in the chicken stock. Bring it to boil. Add capsicum and vermicelli noodles. When it boils again, season with sugar and salt. Toss back the beef. Garnish with green part of spring onion and red chilli. Serve hot. Briefly soak the vermicelli noodles until slightly softened, but don’t be too long as you will further cook them with other ingredients so that they won’t turn mushy. 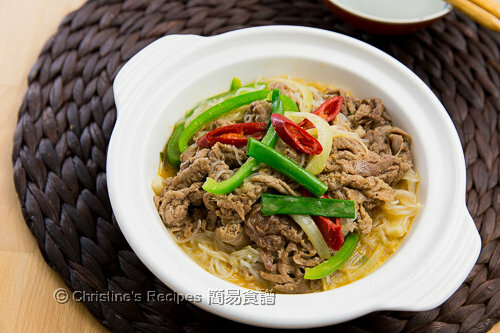 For convenience, you can get the frozen thinly sliced beef for hot pot from Asian grocers to make this dish. Make sure not to over-cook them. Thanks for your kind words, Angie. I like your website very much. Thank you for sharing your wonderful recipes. I am wondering whether you have the Chinese traditional snack, 南乳磞砂 recipe? I have been looking for this recipe for many years but I am still not able to find it. If you do, please kindly share with me. Thank you in advance. Love it! I am going to try this weekend. Thank you for the recipe. Wonderful! Let me know how it goes if you have made it.